Looking back over the Tokyo Ghoul anime, its protagonist’s journey, and that gut-punch of a finale. I’m forgoing my usual review format for a messier, off-the-cuff analysis/reaction, because damn, that finale got to me and my brain is full of cluttered thoughts. Needless to say the following contains major spoilers for the entirety of Tokyo Ghoul, including the Season Two (Tokyo Ghoul √A) finale. Hit the jump at your own risk. Let’s start by saying that I have not read the original manga. I might someday, now that Viz is releasing it stateside, but I haven’t yet. I’m discussing the anime on its own merits, unrelated to the source material (which seems fair in this case, given that we were told beforehand that this season would deviate from the source material). So if you want to have a conversation about the manga vs. the anime, this is the wrong forum for that. I’m apparently in a pretty small minority here, but the Tokyo Ghoul √A finale floored me. I thought it was a masterpiece of sound and staging, a deeply moving work of art that utilized careful dialog, wrenching music, and pregnant silences to tell an intimate, personal, intensely tragic story that refused to give its audience any easy answers or explanations. I like to hyperbolize about how this scene or that show turned me into a puddle of “dem feels,” but in all honesty I rarely tear up and almost never cry while consuming fiction, anime or otherwise. AnoHana was the last series to do that to me before last night, when the TG√A finale seemed to punch the tears right out of me. I was left gasping when the end credits suddenly rolled, cutting through the silence and tension like a gunshot. It was a powerful ending, and nigh perfect in its execution. And then I wrote a whole bunch. It’s messy, but I wanted to throw it out there anyway for anyone interested in an anime-only viewer’s take on the series as a whole. Also, there are pretty screenshots to help break up the text wall, so you’ve got those to look forward to, at least. 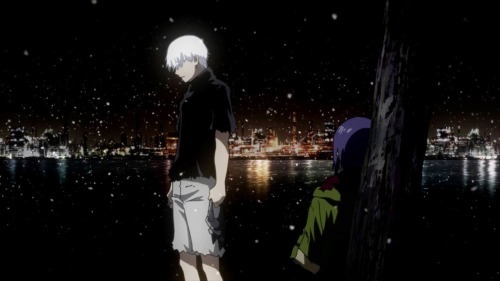 For all its tonal unevenness and occasional forays into cartoonish ultraviolence, Tokyo Ghoul has always had a strong undercurrent of tragedy, and this finale sees that play out. As a quick reminder, and in overly simplistic and general terms, a tragedy is the story of a person or group’s downfall which is caused by a fatal flaw within that person/group. Beyond that, I think there are two broad kinds of tragedies: The Macbeth variety, where we see someone knowingly committing greater and greater atrocities, gradually destroying themselves out of a skewed sense of “the greater good.” The Antihero Tragedy, if you will (and you could make a strong argument that these aren’t tragedies at all, but it does fit the general definition). Then there are the Oedipus tragedies, where a basically decent person is trying to do the right thing but gets caught up in forces stronger than themselves and continues to make the wrong choice, despite their best efforts. I don’t have a fancy name for these, but they tend to be the ones that hit the hardest emotionally, and Tokyo Ghoul certainly appears to fall into this second category. We’ll get into whether it actually does in a minute, but for now, I figure it’s a good idea to look over the series as a whole, and figure out how Kaneki got to where he did. Kaneki’s story and eventually downfall is defined by a series of deaths, both external and internal. 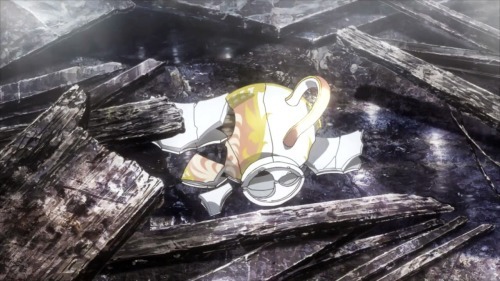 In the first season, Rize and the human Kaneki die in the first episode; bystander Kaneki dies when Hinami’s mother does, as he then works harder to be able to protect others; and “middle ground” Kaneki dies at the end of the first season, killed by Yamori’s torture, Rize’s temptation, and his own indecisiveness (the same flaw that plagued Hamlet, incidentally). From there, Kaneki joins Aogiri Tree, where he plays out the revelations he had in Yamori’s lair: Accept the monster within, kill all who stand in the way of your goal, and become strong enough to protect the people you love (Anteiku, basically). While it wasn’t played out very clearly in-series (I won’t deny that TG and especially √A is full of odd narrative choices and missteps; they just didn’t bother me much), I got the sense that Kaneki was trying to expand Aogiri’s territory to cover the entire city, so that they would have power and control over everyone and then he could enforce a kind of peacekeeping over the entire area, keeping Anteiku safe from rival ghouls and the CCG alike. The sad truth, though, is it that his actions bring the CCG down even harder on the ghouls, eventually leading them to Anteiku and Yoshimura— which, in turn, leads to the senseless slaughter at the end of TG√A. In essence, Kaneki and the overt aggression of Aogiri Tree caused the Battle for Anteiku. I think Kaneki began to understand that this approach was equally flawed when he met up with Amon during the midseason prison raid, but he couldn’t think of a better solution. Violence kept begetting more violence, which eventually led to he and Amon’s pointless showdown, a battle that neither wanted but neither felt they could turn down. Walk away, and a powerful threat does, too—a threat which has already killed many of your allies and will likely continue to do so. The final fight of TG√A was inevitable but also meaningless; there were no good answers, and all either side could do was try to keep their own alive by whatever means necessary. 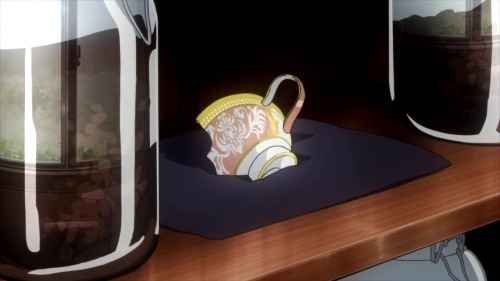 It isn’t until Hide saves Kaneki, pulling him into the shadows of Anteiku for one last cup of coffee (geez, just thinking about it makes my heart hurt) that Kaneki truly realizes how much he’s lost. He lost his human life a long time ago, yes, but he’d managed to build up a ghoul one— a life that Hide envied, even—and tossed that away for a vague goal, a well-meaning but nevertheless arrogant belief that he could protect everything on his own. And in the process, he seemingly loses everything. Except, does he? I said at the start that this episode plays like a tragedy, and I certainly think it does, but I wonder if it actually is a tragedy. 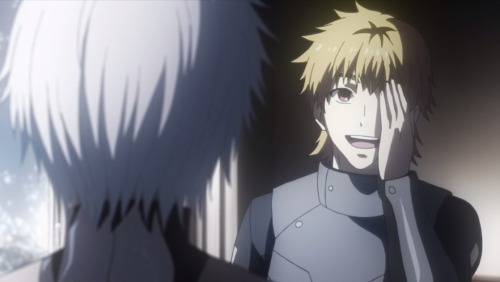 For all that the CCG and many of the ghouls can’t imagine coexistence, character throughout the story have proven this untrue, such as Nishio and his girlfriend and, most importantly, Hide himself, who reveals that he’s known for a while about Kaneki’s change but that it didn’t matter to him. For the first time, Kaneki finds someone who knows both sides of him—human and ghoul—and accepts them equally. It’s only once Kaneki has this that can he finally lower his sword and “go home,” crossing the barricade and acknowledging his human side once again. And this, I think, is what ultimately saves Kaneki and keeps us from a truly devastating ending. It’s unclear whether Hide is dead by the time Kaneki takes him to the CCG. Kaneki may be trying to save him; he may just be returning his body for a proper burial. It’s equally unclear whether Kaneki himself survives this decision. But I’m also not sure it matters. Regardless of whether it’s literal, this is Kaneki’s final “death,” when he abandons his pride, his belief that he can “save everyone” through his strength, and simply tries to do right by a single person whom he loved. It’s a kind of rejection of the traditional action/adventure or superhero ending, now that I think about it. It’s also the first time we’ve seen either side simply refuse to fight, and there’s a question of how the CCG will respond to that. We never see it, but we can speculate. Maybe Kaneki was captured and now actually can serve as that bridge between worlds, the way Yoshimura wanted. Or maybe that’s too optimistic for a show as melancholy as this one. 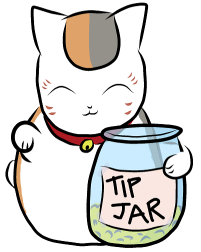 But then again, the sight of Touka in the end credits, living peacefully with her own cafe, suggests that we’re supposed to take something hopeful from this, in the end. In a way, the Kaneki (and Yoshimura) from the first season did manage to do some good for Touoka, encouraging her to apply for college and walk a road much closer to normalcy than she would have otherwise. 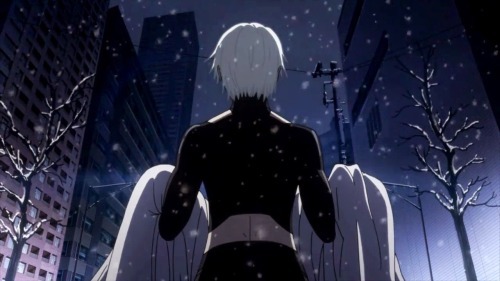 That it was this peaceful, non-combatant version of Kaneki that had such an impact on her (and Hinami, whom we don’t see in this scene but is presumably alive somewhere) neatly summarizes Tokyo Ghoul’s rejection of the “strength = physical aggression” mentality. There’s no neat answer here, not really, but there is possibility, and it comes in the form of individual people caring for each other rather than broad groups and violent ideals. In a world this broken, maybe that’ll have to be enough.